The International Association of Registered Financial Consultants (IARFC), gives credit to its E-News Advisory Committee for the timely publication of the Electronic Newsletter. This practitioner-oriented, financial newsletter, published twice a month, includes financial services industry focused articles, interviews, book reviews, practice management techniques, product information and marketing recommendations. Laura Stover, RFC®. LS Wealth Management LLC™ – Bryan, OH. The Advisory Committee exemplifies the participation of volunteer members while expanding member relationships. Its mission is to update members on current matters, along with listing conferences with CE approved curriculum for the IARFC member. 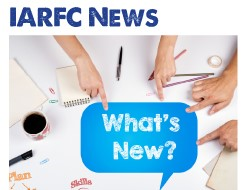 The IARFC Consultant E-News goes to IARFC members who are, practitioners, academicians, and decision makers in financial services, plus selected others who are non members, MRFC certificants, and candidates for the RFA®, RFC®, and MRFC. The International Association of Registered Financial Consultants (IARFC), is a non-profit association established in 1984, that offers other designations – the Registered Financial Associate (RFA®), the Registered Financial Consultant (RFC®) and, the Master Registered Financial Consultant (MRFC) accredited credential (accredited by the NCCA) . The RFA®, RFC®. and MRFC are listed on FINRA. To become a member of the IARFC and take advantage of all the member benefits visit http://www.iarfc.org.